The Pennsbury Land Trust Invites You! Thursday, April 5, 2018, at 7:00 p.m. The Brandywine has flowed through centuries of environmental changes, yet steadfastly remains the centerpiece of our local culture, landscape and economy. How do we impact The Brandywine? What are we doing to protect this valuable resource? Build your Awareness by joining us for this special presentation and Q & A. This is a FREE, PLT-sponsored event. Complimentary wine, cheese, sweets and coffee will be served. In 2011 Pennsbury Land Trust began a proactive environmental stewardship initiative to monitor and protect the water quality of five streams in the township: Ring Run, Bennett's Run, Craig's Run, Cossart Creek, and Pocopson Creek. The all-volunteer PLT Stream Watch Program conducts biological macroinvertebrate and water quality chemical testing. Plans include expansion of the volunteer network and building awareness of the need to be vigilant about protecting our water. 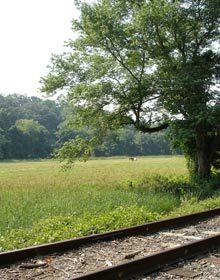 In 2012 Pennsbury Land Trust developed a proactive environmental stewardship initiative to plant trees to keep our Brandywine Watershed tributaries healthy. Reforestation improves water quality by reducing erosion and improving in-stream plant and animal habitat. Special projects will be planned and announced in future. Protecting land is a partnership. PLT strives to be a partner to all landowners - from those who want basic information on how to take care of their properties to those who need advice on how to preserve their land for future generations. PLT shares expertise with other conservation organizations including Brandywine Conservancy, Natural Land Trust, North American Land Trust, Pennsylvania Land Trust Association, Land Trust Alliance, Brandywine Valley Association, and more - but its focus is its backyard, its strength is local, and its effectiveness relies on the community to which it is devoted. A long term initiative - The Land Trust promotes conservation awareness to encourage stewardship responsibility. Thursday, April 10, 2014, 7:30 p.m.. Guest Speaker: Vidya Rajan, PhD. Thursday, October 12, 2017, at 7:00 p.m.
Join us on Thursday, October 12 as our special guest, Shelia Fleming of the Brandywine Conservancy speaks on The Fight for Land and Water. Topics will include the impacts of development, including environmental, financial, and the quality of life issues. We will also address the benefits of land preservation, and explain how the process works. Information will be provided detailing who the decision makers are and how citizens can influence the process of saving land. A question and answer session will follow the presentation. Refreshments will be served. Admission is free. RSVP is requested, 610-388-7323 or pennsburylandtrust@gmail.com. Steven Saffier has been instrumental in developing the National Audubon At Home initiative which brings attention to the natural world we see in our backyards, schoolyards, small and large open spaces and how that natural world connects to migratory and year-round birds. What makes these areas attractive to birds? Why do certain migratory birds choose to stop by our township? Steven has worked for the National Audubon Society since 2003 and at its state office in Pennsylvania since 2007. He developed the first statewide backyard habitat registration program in the Audubon network and one of the first municipal programs. He is on the development committee of National Audubon’s forthcoming Bird Friendly Communities Initiative. Please join us in welcoming Steven Saffier as our PLT 2017Annual Meeting speaker. Get a bird’s eye view of what specific native plants provide resources for both migratory and year-round bird species. Learn what you can do to welcome birds into your backyard while providing ecological landscaping that has far-reaching benefits in creating a healthy and sustainable environment for us all. This is a FREE, PLT-sponsored event. Reservations are requested, but not required. RSVP by email (pennsburylandtrust@gmail.com or by note to PLT- Speaker Series, 702 Baltimore Pike, Chadds Ford, PA 19317. Wine, cheese, sweets and coffee will be served. Specific questions for Steven may be submitted in advance to pennsburylandtrust@gmail.com. Saturday, September 24th - 9:00 A.M.
Saturday, October 8th – 9:00 A.M.
Saturday, October 22nd – 9:00 A.M. Volunteers are sought to join our Stream Watch Team in monitoring the water quality in Pennsbury waterways. On site training is provided. Learn about the wildflowers, plants, and trees native to Chester County. Get ideas for using them in formal or naturalistic design in your backyard. Guest Speaker: Karen Travers, biologist with Mount Cuba Center Learn how to site, plant and combine local favorites to add color, interest, and natural beauty. The Pennsbury Land Trust has invited tree expert Jason Lubar to share information with local residents on how to care for backyard trees that may have suffered from storm damage or disease, what to do to protect trees and keep them healthy. Jason is an associate director of urban forestry, Morris Arboretum, University of Pennsylvania, a board-certified master arborist, and has been a popular consultant featured on regional radio talk shows and in regional press. This is a FREE, PLT-sponsored event. Reservations are requested, but not required. RSVP by email (pennsburylandtrust@gmail.comor by note to PLT- Speaker Series, 702 Baltimore Pike, Chadds Ford, PA 19317. Wine, cheese, sweets and coffee will be served. Specific questions for Karen may be submitted in advance to pennsburylandtrust@gmail.com. Garden Design for Naturally Beautiful Home Landscapes. Thursday, April 9, 2015 at 7:00 p.m. The Pennsbury Land Trust annual public meeting will feature a landscape designer who will provide tips on how to make your yard look beautiful using native plants. Create a home landscape using easily grown native plants suitable for this area in both formal and naturalistic gardens. Beside exceptional attractiveness these plants provide valuable ecological services. The staff of the renown Mt. Cuba Center will offer practical advice on selection, placement and care of some of our best native plants. Attendees will be provided with a resource guide listing native plants and local nurseries that supply them. Come learn about the care and maintenance of your backyard trees by attending the Pennsbury Land Trust's free presentation. Meet at Pennsbury Township Municipal Building, 702 Baltimore Pike, Chadds Ford, 19317 to carpool to the site. Join this practical hands-on workshop to learn about the importance of clean water and how to assess and monitor water quality in our streams. Water quality is evaluated through analysis of physical characteristics and chemical tests. Find out how you can be part of our stream watch team. Suitable for adults and children ages 10 and up. Wear outdoor clothes and shoes that can get wet and muddy. Click Here to for the Annual Meeting Flyer. Due to the flooding of the Brandywine, the Pennsbury Mill Reforestation Project has been rescheduled for Saturday, May 10. Pennsbury Township and the Pennsbury Land Trust are joining in an unprecedented partnership with The Brandywine Conservancy and the Unionville-Chadds Ford School District to stabilize a portion of the Craig's Mill Run stream which has been impaired by erosion. Join us on Saturday, October 12, 2013, for the planting of 600 trees at the Hillendale Elementary School. The project is supported by a grant from the Pennsylvania Horticultural Society Tree Vitalize Program. A recent survey of Chester County residents showed that preservation of open space and maintaining the quality of our water are considered important priorities. This should be a fun experience for anyone interested in protecting our natural resources and maintaining the natural beauty of our township. All are welcome to join us, no experience is necessary. Educational exhibits and hands-on science activities will be provided to show what each of us can do to help keep Pennsbury Township a healthy and beautiful place to live. Meet in the School Parking Area at 9:00 a.m. We suggest that you wear heavy shoes and rugged clothes and please bring gloves and shovels. We anticipate cancellation due to rain only if it is really pouring; call 610-350-7605 on the day of the event for final word. Saturday, September 15, 2012 10:00 a.m.- 12:00 p.m.
All welcome! No experience necessary, we will train. Volunteers of all ages are encouraged to join us as we perform tests to monitor water quality. Learn what each of us can do to protect our clean water. We will study water chemistry and evaluate the species of invertebrates living in Craigs Mill Run stream. Meet at the Pennsbury Township Building at 10:00 a.m. and we will carpool to the site. Topic: "Saving the Brandywine Battlefield"
Topic : "Connecting Open Space – The Brandywine Greenway Corridor Program"
RESTORING OUR FORESTS: a Vital Community Resource. Wes will talk about the history of forests in southeastern Pennsylvania, including the dramatic loss of woods and the loss of their critical “eco-systems.” He will describe actions the Conservancy is promoting to implement reforestration actions as part of the Reforestration Campaign – from individual residents, landowners, municipalities, schools and service groups. Hillendale School/ Craig’s Mill Run Storm Water Management Project – October 12, 2013. When: Saturday, April 16, 2011; time: 9:30a.m.-12:30a.m. Where: Meet at Pennsbury Township Municipal Building, 702 Baltimore Pike, Chadds Ford, 19317. for an introduction before carpooling to a nearby stream. Healthy local streams are critical to a pure drinking water supply for ourselves and wildlife. Join this practical, hands-on workshop to learn how to access and monitor our streams using simple biological and chemical tests. Find out how you can be part of our Stream Watch team. Equipment, handouts, and refreshments provided. Suitable for adults and children ages 10 and up. Wear outdoor clothes and shoes that can get wet and muddy. The workshop facilitator is Kathy Bergmann, Coordinator of the Brandywine Valley Association’s Red Streams Blue Program dedicated to improving the water quality of the Brandywine Watershed. Cost: Free. Pre registration is required. Registration deadline April 11. Join Pennsbury Land Trust board and biologists for an exciting discovery romp at a 90-acre easement property in the Brandywine corridor as fall paints the fields and woods a rich gold. See how the croplands, woods, fields and pond and stream are being managed for healthy habitats and locally grown produce. Watch for fall wildflowers, migrating birds, and wildlife getting ready for winter. Wear comfortable outdoor clothing with sturdy shoes. Each child will decorate and take home a small pumpkin. Suitable for children age 6 and up. Children must be accompanied by an adult. Cost: Free for Land Trust members; $5 per non-member adult, free for children. Pre registration required. To Register: Call 610-388-7323 and leave name, phone number and/or email, and the number of people you are registering for. Or register via email pennsburylandtrust@gmail.com Registration deadline is Oct 22. Sunday, April 25th 2010, 1-3pm. Meet at Pennsbury Municipal Building for the short carpool to the Preserve. Free to Pennsbury Land Trust members; $5 for others. Join us for a walk in Pennsbury’s recently acquired 36-acre wooded stream valley preserve. Discuss the ecology, the location of future trails, and future management of this valuable area as we search for spring wildflowers, returning birds, amphibians and stream invertebrates. Wear sturdy footwear for uneven and possibly wet ground. contamination risks? Guest speaker Dave B. Arscott, Ph.D., Assistant Director, Research Scientist at Stroud Water Research Center, will present on Thursday, April 8th 2010, 7:30pm @ Pennsbury Township Building: 702 Baltimore Pike,Chadds Ford, PA. Download flyer. RSVP requested but not required (610-388-7323). Refreshments will be served. Saturday, March 20th 2010. 9:30-11AM @ Pennsbury Township Building: 702 Baltimore Pike, Chadds Ford, PA. Gardening experts will give advice on how to create a winning vegetable garden. Fee is $5; free to Pennsbury Land Trust members. To register call 610-388-7323. Download flyer for complete details. Discover how our local natural systems work as we visit several beautiful sites in Pennsbury and Kennett Square. Experts will share practical tips on evaluating and managing both large and small properties to encourage desirable wildlife in healthy habitats. Join us for one or all three sessions, each with its own educational focus. Light refreshments will be provided. Using the pond, stream, woodlands and fields of Pennsbury Township Park learn how to enhance your own backyard, large or small, for desirable wildlife. Discuss techniques for encouraging native plants, birds, and butterflies while discouraging undesirable invasive alien plants. Identify emerging wildflowers, returning birds, and awakening spring amphibians. Take home a list of locally available native plants best suited to this area. Leader is Pennsbury Land Trust president and biologist Karen Travers. Visit a private 285-acre property in Kennett Square along the scenic Bucktoe Creek where the landscape is being restored. Director of the Bucktoe Creek Preserve, William Ryan will offer some practical ecological restoration techniques you can apply to you own property. Observe native wildflowers and birds in the peak of spring. Visit 2-3 small local properties that have incorporated native plants to enhance wildlife habitats. Landowners will share their challenges as well as successes with woodlands, wetlands, ponds, and rain gardens. Take home a native plant and many ideas for you own property. Pennsbury Land trust events and activities, including the Annual Meeting, will be posted here when details become available.